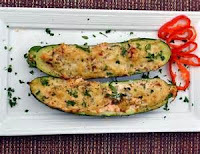 Cut zucchini in half lengthwise; scoop out centers leaving 1/2-inch shell. Finely chop the meat of the zucchini. Heat the oil in a large skillet over medium-high heat; saute the chopped zucchini, onion, and garlic until the onion is tender, less than 5 minutes. In a large mixing bowl combine the Swiss cheese, both flours, parsley, beaten eggs, salt and pepper; mix together well. Stir in the zucchini mixture. Stuff the zucchini shells with the mixture; sprinkle the Parmesan cheese over all. Bake 30 to 35 minutes until the filling feels firm and is a golden brown. Per serving: 211 calories, 14 g (5 g sat) fat, 123 mg cholesterol, 285 mg sodium, 13 g carbs, 11 g protein.